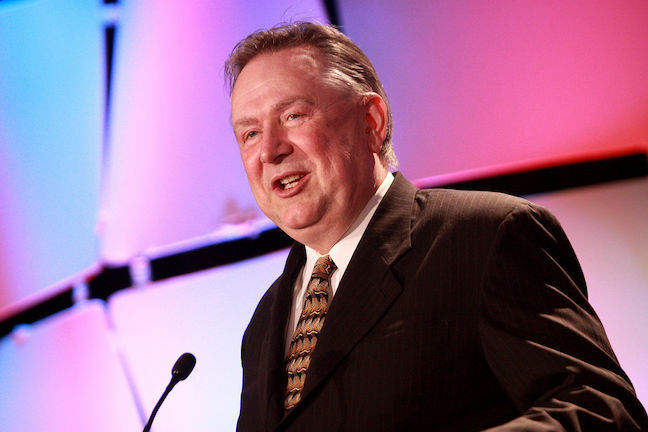 HOUSTON (CN) — A political operative testified Thursday that he helped former Texas Congressman Steve Stockman raise $350,000 in charitable donations with the bogus claim that they would buy a Washington townhouse to serve as a club for young conservatives. Thomas Dodd worked as a chief congressional aide for Stockman in 2013 and 2014 during Stockman’s second term in Congress. Stockman, 61, was 37 when he upset longtime incumbent Democrat Jack Brooks in the November 1994 election for Texas’ Ninth Congressional District, which at the time formed a triangle around Galveston Bay encompassing Galveston, East Houston and Beaumont. As a freshman congressman, Stockman backed House Speaker Newt Gingrich’s battle with President Bill Clinton over the federal budget in 1995, a standoff that caused a brief government shutdown. During his first stint in Congress, from 1995 to 1997, Stockman developed a reputation as a Capitol Hill outsider with a fondness for militia groups and gun-control conspiracies, including a claim that the Clinton administration staged the February 1993 raid on the Branch Davidian Christian fundamentalist compound in Waco to justify banning assault weapons. Stockman won his second congressional election in 2012 with the endorsement of the Tea Party movement. He is fighting a 28-count indictment accusing him of fraudulently soliciting $1.2 million in charitable donations to pay for his campaigns and personal expenses. Dodd, bespectacled, bearded and well-spoken, bent his 6-foot-4 inch frame in the witness box toward a microphone, apologizing when he got too close to it and his deep voice boomed through feedback in the speaker system of U.S. District Judge Lee Rosenthal’s Houston courtroom. Dodd testified Thursday that he specializes in soliciting donations from “high net-worth people,” and that he met Stockman in the early 2000s while working as a fund raiser for the Leadership Institute, a Virginia nonprofit that trains conservatives in political organizing. Dodd pleaded guilty in March 2017 to mail fraud, wire fraud, and lying to the Federal Election Commission, and agreed to testify against Stockman. According to Dodd’s plea deal, he helped Stockman funnel nearly $800,000 through several of Stockman’s nonprofit shell companies to his campaigns from 2010 to 2013. With federal prosecutor Melissa Annis introducing exhibit after exhibit — emails and text messages between Dodd and Stockman and donors they targeted — Dodd described how he and Stockman prepared a funding proposal for Richard Uihlein, a Chicago businessman, who through his charity The Ed Uihlein Family Foundation donates millions of dollars to nonprofits that back Republican politicians. Soliciting funds in the name of the Congressional Freedom Foundation, Dodd said he and Stockman met with Uihlein in early 2013 and gave him a pitch letter, excerpts of which Dodd read in court Thursday. “‘The Congressional Freedom Foundation, an organization dedicated to teaching, training and mobilizing conservative activists.’ Is that statement accurate?” Annis asked. “No, it’s not accurate,” Dodd said. Dodd said Stockman asked Uihlein for $1 million to support creation of Freedom House, a townhouse in Washington, D.C. that would be a meeting place, dorm and training center for young Republicans, and they included pictures of a home in the pitch documents. It is illegal under federal law for charitable organizations to donate to political candidates or campaigns. Dodd testified that Uihlein agreed to provide about one-third of the requested $1 million and sent a $350,000 check, which Stockman deposited into the account of his sham charitable foundation. Dodd said Stockman immediately wrote a $31,000 check from Uihlein’s donation to pay off Dodd’s credit account. Prosecutors say that Stockman spent the $350,000 within a year, but spent none of it on the Freedom House. “He spent it to enrich himself and to fund his campaign,” prosecutor Robert Heberle said on March 20 during opening statements. During cross-examination, Stockman’s attorney tried to portray Stockman as an ambitious, hapless man who often gets in over his head. “Would you agree that Stockman can be prone to biting off bigger projects than he can chew?” Buckley asked. “Would you agree that Stockman, in many situations, or in some situations, has genuinely good ideas that somehow fail in the follow-through stage? You agree with that, right?” Buckley asked. “I don’t know if I agree with that characterization,” Dodd said. “Because I’ve known Mr. Stockman for a fair number of years. I met him after he ran for Congress the first time, but my understanding was that he did something significant with organizing to get elected to Congress the first time,” Dodd said. Stockman first worked with Dodd from 2005 to 2007 at the conservative Leadership Institute, as director of its campus leadership program. The trial is expected to continue for at least another week after it resumes on Monday.